1" Turned, ground and polished steel crankshaft. Long lasting, heavy duty, durable sealed bearings. Engineered for most efficient operation in low and high wind speeds. Allows windmill to save energy but still produce maximum air volume and maximum longevity. Engineered for most efficient air production and maximum diaphragm life. The large surfaced tail area provides maximum control in all wind speeds and ensures efficient overall operation. Tail arm rigidity further ensures windmill control. Top mounting and connected through a rigid pivot tube, provides smooth operation and mechanical longevity. Compressor top air valve assembly makes for very easy maintenance. Re-engineered to eliminate ice build up. The strong, cross brace reinforcement design gives added strenght to any tower height. This design also discourages climbing of the tower. 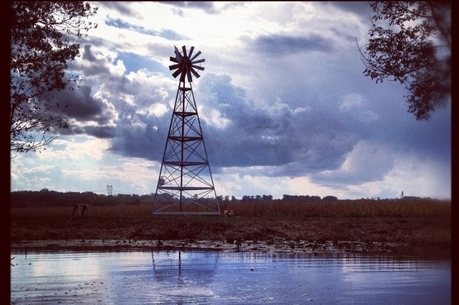 The Koenders Windmill can be located up to approximately 1000' from the water source.